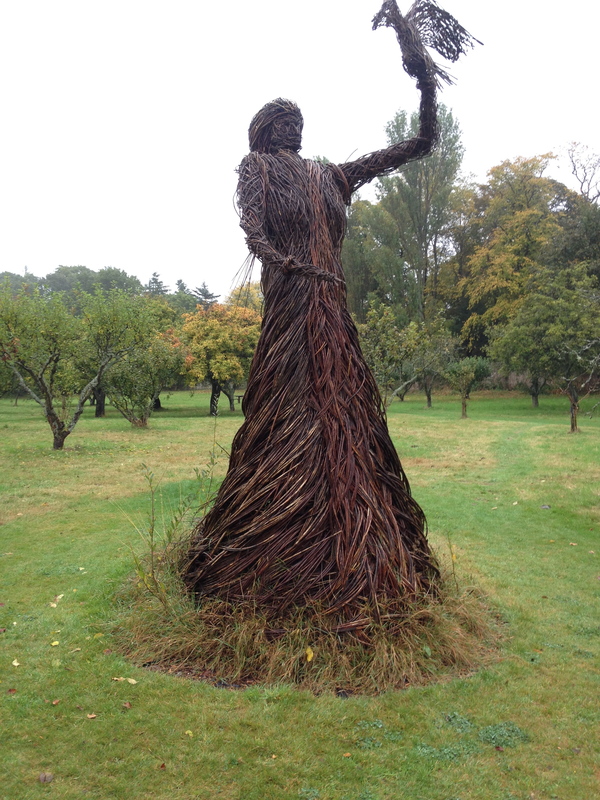 Trevor Leat’s sculpture of a falconress (perhaps meant to be Mary Queen of Scots) at Falkland Palace, Kingdom of Fife, Scotland. My friend and professional mentor Jill Swenson had reminded me once again—“no egg heads on Facebook.” I figured it was time to take action. I have been slow to join Facebook because I struggle with reticence, but having found Twitter a treasure trove of interesting associations and even new windows into the natural world, I decided to dive into Facebook and solve the egg head problem. But, what image should signify my presence in the world of Facebook? Myself? A photograph of me taken 30 years ago recently turned up. I could photograph that with my iphone and use it, but it seemed so vain to use my youthful unblemished self. On the other hand, my newer, older, self is less pleasing—the neck wrinkles, the liver splotches, the creases around the eyes. I love old faces, but mine is in transition, a work in progress, not fully perfected. When I have, hopefully, reached the fullness of true old age, I intend to love my wrinkles. I started looking through my digital photos, quickly, because the whole idea of choosing an image, the opposite of an egg head, made me nervous. 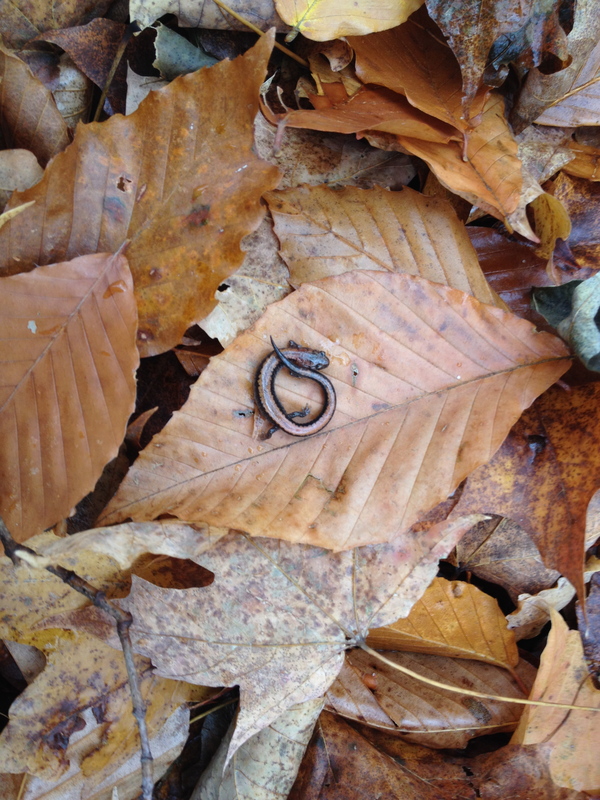 A lovely salamander appeared, coiled like a rune or a Buddhist symbol on overlapping, damp leaves. So lovely, but perhaps indecipherable when reduced in size. I stopped at a beautiful purpley red sunset. A cliché? 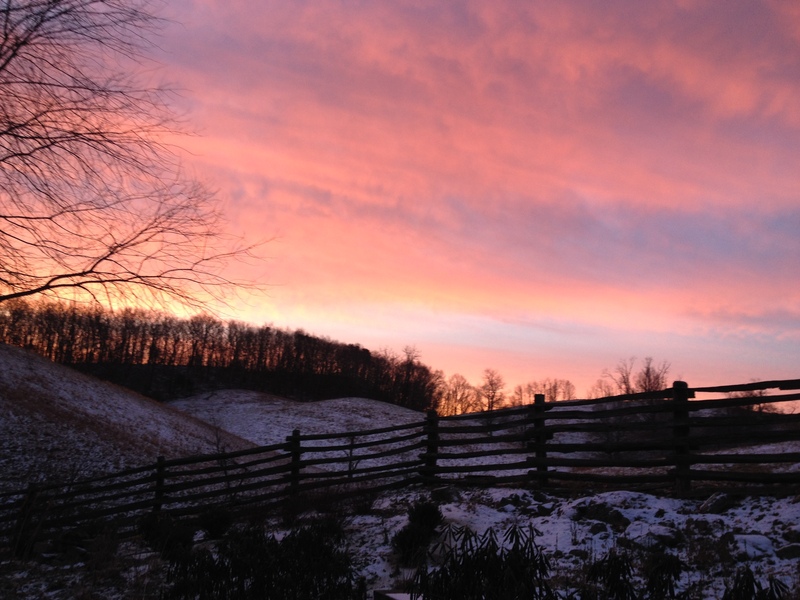 Sunset in Vinegar Hollow, Highland County, Virginia. A sunset should never be taken for cliché, but, out of context, brought into Facebook as avatar, no, I would not want to reduce the beauty of any sunset to the level of cliche–the danger of representation at the hands of an inept human. Then the pond at Seven Fields appeared. 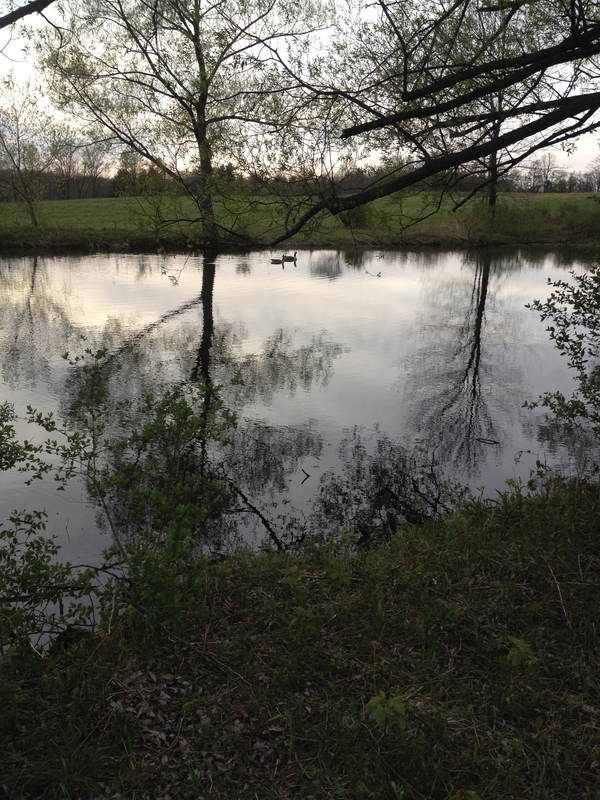 Countless times I have tried to catch reflections in this pond: the crooked tree, the branches, the necks of the geese. I love this tree and this pond, but reduced, perhaps not the tribute I would most wish. Pond, trees, and geese at spring-fed pond, Seven Fields, Enfield, Ithaca, New York. 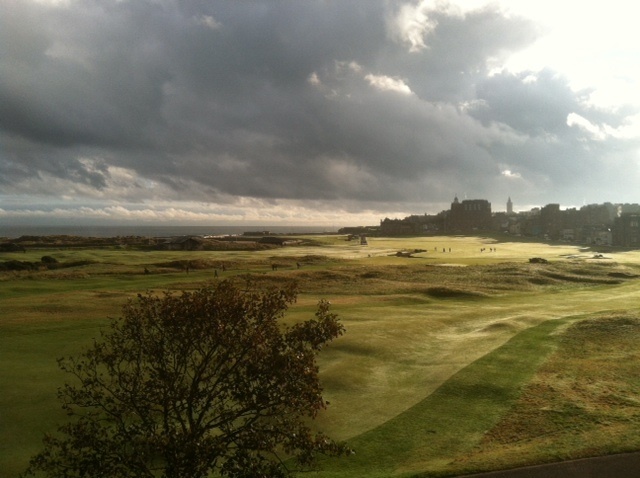 Then I moved into photos taken on a recent trip to Scotland to see younger son, the golfer, who was studying at St. Andrews, Scotland for a semester. 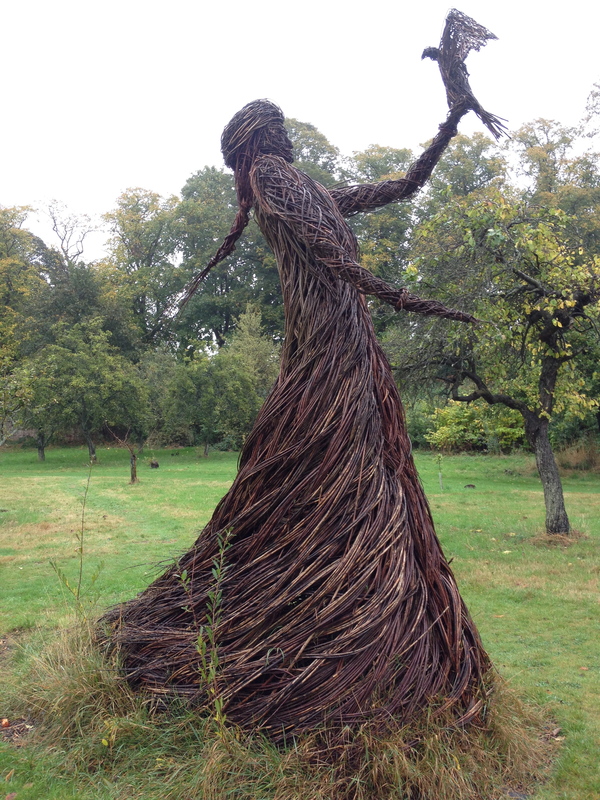 While the golfer was studying, writing gobbets, my husband and I roamed the Kingdom of Fife, happening upon Falkland Palace, and there she was, the one I am calling the Falconress, the work of Scottish sculptor Trevor Leat, who creates large, expressive sculptures made from many varieties of willow that he grows organically. Some of his large pieces are burned at festivals, like Edinburgh’s Hogmanay celebration. Mary Queen of Scots spent a few happy years at the palace as a young woman. We saw her tennis court (she was an avid player) and her ornately carved bed. However, after seeing her death mask, it was a relief to go outside, though it was a rainy, misty day in mid-October. Tall dark-brown stalks of giant delphiniums tilted against a long stonewall. Giant cedars towered luminously, blue-green in the mist. A small greenhouse glowed with climbing geraniums in all shades of red. Two large garden beds were entirely planted with pale lavender-grey phacelia, a species good for soil improvement the sign said. Falkland has received awards for being one of the most floriferous villages in Scotland. The perennial beds of Falkland Palace must be one its glories in summer. 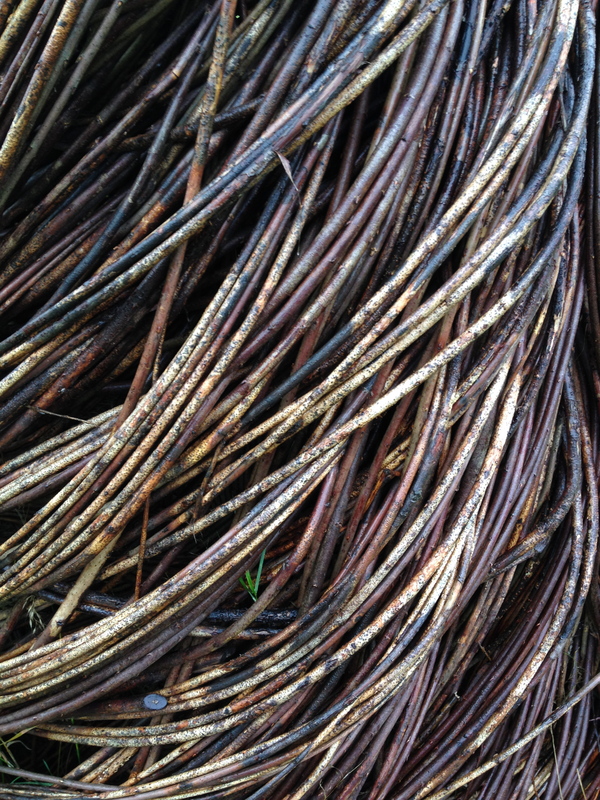 The many hues of the sculpture’s weathered willow branches. 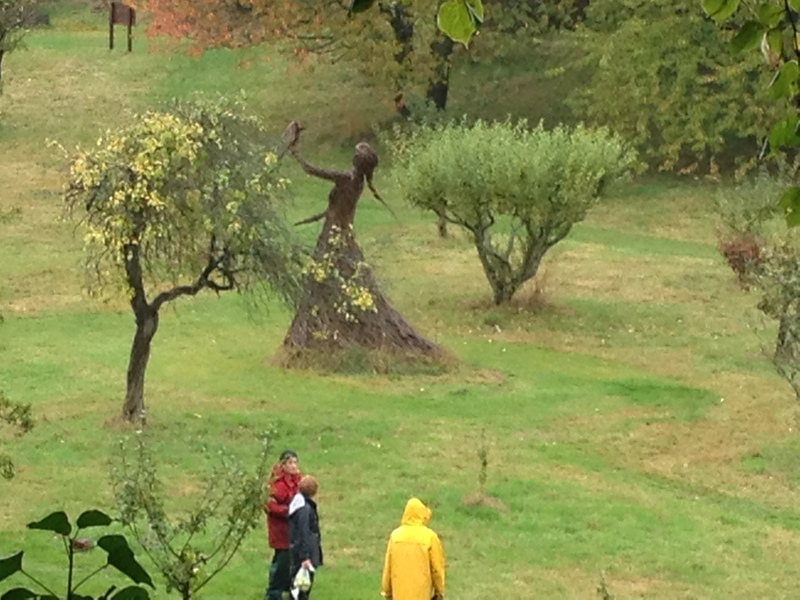 The gallery of sculptures, posted on Leat’s website and available elsewhere, shows that he is drawn to archetypal forms, like the stag and the human female. Leat’s female figures have flowing lines and generous proportions, and their earthen colors, golden browns, beiges, and greens, glow in an outdoor landscape. Although his women are tall and robust, their arms taper to delicate wisps. Apparently some of the sculptures bud out in spring, I suppose because some of the willow branches are still green enough or root into the ground a bit. 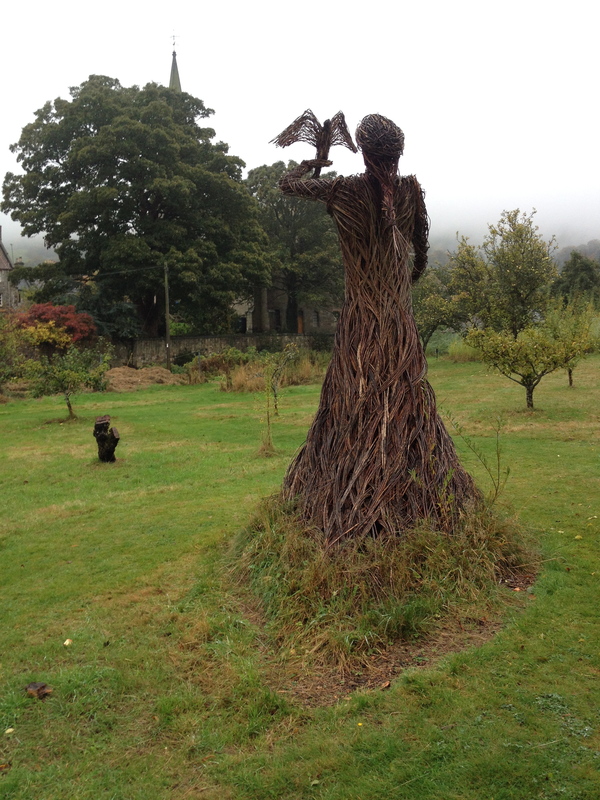 Willow sculptures in the outdoors transform gradually, broken down by sun and rain, often just lasting five years. The falconress leaves a verdant train in her wake. A history of Falkland Palace states that the Stewart monarchs used the palace to practice falconry, so it is fitting that Leat’s sculpture of the Queen shows her in the attitude of falconress. A brief perusal of the life of Mary Queen of Scots is enough to put one off a royal life for an eternity. The intrigue, the double dealings, the difficult men, it was all dastardly and over the top. She handled the beheading, apparently, with equanimity and grace, thankful perhaps that her life was finally over. During her imprisonment she was allowed to fly a merlin in and out her window. This must have been a pleasure, being so close to a wild creature, a vicarious experience of freedom. One can imagine her listening to the swoosh of feathers through the air at take off and her watching the bird disappear into the sky. I have never been attracted to falconry, though I am a great fan of T. H. White’s The Once and Future King, where the art of falconry figures, and The Goshawk, an account of White’s tempestuous relationship with a young hawk he tried to “tame,” his first, and last, attempt at being a falconer. For a current account of falconry practiced in North America, see Rachel Dickinson’s book Falconer on the Edge: A Man, His Birds, and the Vanishing Landscape of the American West. White’s Merlyn is a great fictional character. He advised (my paraphrase): when you are sad, learn something. This is good advice. Some historians speculate that falconry began between 4000 and 6000 BC. A Japanese historical narrative of 355 AD, Nihon-shoki, states the first falconer in Japan was a woman, whose daughter followed in her footsteps. Women in 19th century England were said to outshine men in proficiency. The word “falconress” is not in the OED, however. The only use of the word I have come across is in a poem by Robert Duncan called “My Mother Would Be a Falconress.” The poet compares the relationship between mother and child to that of the falconress and her falcon. It’s a dark, moody poem reflecting some of the strangeness of the relationship at the heart of falconry–and at the heart of parenting. Nevertheless, Leat’s sculpture appeals to me. Both bird and woman appear poised for flight. She is both sinew and grace. How lovely to be made of willow! A final view of Trevor Leat’s falconress.